Also known as Devil's Fire or Hobgoblin's Playground, Little Finland is the unofficial name of a remote area in the Mojave Desert near the north end of Lake Mead, within Gold Butte National Monument, where a plateau of red/orange Aztec sandstone has been heavily eroded into amazingly complex and intricate forms, over an area 2,000 feet by 400 feet. 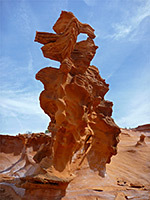 The site is similar to other renowned Southwest locations of photogenic eroded rocks, having, for example, similar colors to Goblin Valley, and the same kind of weathering patterns as Fantasy Canyon, but this place is more unusual than either of those two, on account of the complexity and variation of the rock forms, the relatively large area that they cover, and the scenic surroundings; the plateau is backed by taller, more conventionally eroded cliffs to one side, while to the other, the land slopes down towards Lake Mead, allowing long distance views over many square miles of roadless desert, interrupted by some taller hills and other colorful sandstone outcrops. 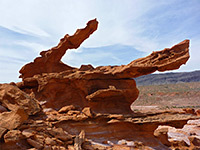 Many of the formations are very fragile - thin spurs extending several feet from their base, tiny arches, narrow fins - and doubtless some have already been damaged since the region was first publicized around 20 years ago. But Little Finland is likely to remain relatively little visited owing to its remote location: the place is 37 miles from a major highway, on roads which decline from paved and fairly smooth, to partially paved but bumpy, unpaved but relatively good, unpaved and very stony, finally the last few miles where the surface is even rougher (in some places) and the drive requires a 4WD vehicle. A busy day might see half a dozen visitors but most of the time there are no people here. For the majority of visitors who do not have 4WD vehicles, Little Finland can be reached by cross-country hiking, starting 12 miles back along the approach road, which ahead takes a rather circuitous route, so the walking distance is rather shorter. 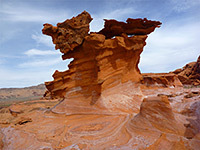 The minimum is 3.5 miles, but there are several other interesting areas close by such as short slot canyons, petroglyphs, eroded rocks in many contrasting colors (unlike Little Finland where the sandstone is only red or orange), and a round trip of ten miles allows some of these sites to be visited en route. If driving all the way, the track ends close to the base of the plateau, so the only hiking needed is the short climb to the top. The formations themselves can all be seen in an hour or so, walking perhaps another mile. 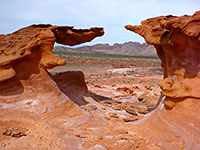 There is no charge to visit, nor to camp anywhere in this region; all is publicly owned BLM land, and nearby Whitney Pocket is a popular place to stay, even for quite large RVs. Off-road vehicle use has increased in recent years, and added to the visitation to Little Finland, though very few people explore by hiking cross country. 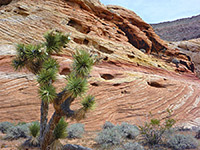 The drive to Little Finland, Whitney Pocket, and many other backcountry locations in Gold Butte National Monument starts along Gold Butte Road, 3 miles from I-15 exit 112. This narrow road runs alongside the east bank of the Virgin River for a few miles, passing no development apart from a melon farm, cultivating one of the few flat areas hereabouts; most of the river is enclosed by low, dusty hills. The road surface is good at first but becomes more bumpy as the route turns southeast, climbing into the hills then descending after a while to a wide plain, reaching a junction after 14 miles. Continuing straight on, the road becomes partially unpaved though still relatively good, as it crosses desert flats, soon coming close to a red rock outcrop, and another just after, beside a second junction, where Black Butte Road forks off southwards. 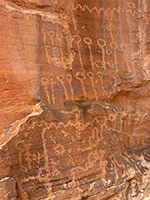 Whitney Pocket is short distance ahead, around a third junction, and here Gold Butte Road bears right (south). 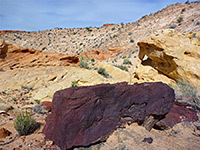 Although still a major backcountry route, the surface is now noticeably more uneven, formed of hard-pressed stones, and it becomes steadily rougher. The next intersection is after 7.2 miles, just after the crossing of Mud Wash, where a short track leads southwest to a sinkhole (Devils Throat), just before which another route - Mud Wash Road - forks off westwards, following close to (or directly along) the wash for 6.6 miles. The final section (2 miles) is back east, up a tributary drainage to the base of the Little Finland plateau. This wash has in the past been fenced off by the BLM a little way from the plateau, entailing an extra half mile walk, but the barrier has recently been removed. 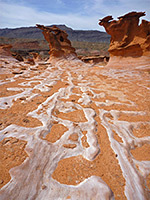 Little Finland sits on top of a flat bench, about 50 feet above the sandy ground to the west, across which runs a small, branched, seasonal wash, the surroundings partly stained white by salt deposits. 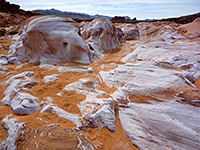 A similar whitish covering has formed around some of the red rock formations, more so in recent years, which adds another contrasting element to the landscape. 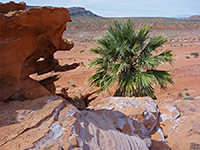 Seeps at the base of the bench sustain several large palm trees, an unusual sight in this generally arid, desert region. The rocks extend about half a mile north to south, the best ones concentrated around the north end and close to the western edge. As ever, sunrise and sunset are the best times for photography since the colors are richer and the shadows more interesting, but there is enough variety of form and color for good scenes at any point in the day. 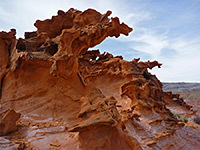 Many formations look superficially similar, however, and it does take some time to find interesting perspectives.